This 13 night / 14 day safari highlights the many faces of the spectacular Namib Desert and Etosha Park. The Namib is the oldest desert on earth, and certainly one of the most picturesque, boasting a diverse array of habitat types and supporting a surprising volume of wildlife. From the giant red dunes of Sossusvlei to the eerie Skeleton Coast, the rugged mountains of Damaraland, and the abundant wildlife of Etosha National Park, the Remarkable Namib Safari is a comprehensive exploration of one of Africa's most beautiful and unique ecosystems via a range of exciting activities, from a dolphin cruise with beach picnic to tracking desert rhinos on foot and the opportunity to climb one of the highest dunes in the world. Maximum group size is eight, and the safari is best suited to the slightly more adventurous traveler as some days involve long drives on dirt roads. You will be met on arrival by your guide at Windhoek International Airport for the start of the safari. From Windhoek it is roughly a six hour drive through the scenic Khomas Hochland Mountains to Kulala Desert Lodge. With its ideal location on a private reserve adjoining the National Park, Kulala is the perfect base for exploring the iconic dunes of Sossusvlei and the other-worldly landscape of Dead Vlei. A dramatic morning charter flight takes you over the Sossusvlei dunes and along the southern stretches of the Skeleton Coast to the coastal town of Swakopmund, an idiosyncratic settlements that blends 19th Century Bavarian architecture with contemporary African culture. Spend two nights at Namibia's oldest hotel, the Hansa Hotel with an opportunity to explore this quirky outpost of civilization on the Skeleton Coast. Day 4 starts at 9am with a marine cruise exploring Walvis Bay Harbor, and the chance of spotting marine life such as pelicans, dolphins and seals. At around 11h30, our skipper will drop us off on a deserted beach, where our Sandwich Harbor guide will meet us with a 4x4 Land Rover. Proceed to the remote Kuiseb River Delta, a series of saltpans and wetlands just north of the Sandwich Harbor Lagoon, with the possibility of seeing flamingos and a wealth of other birdlife in one of southern Africa’s richest and most unique wetlands. En route, enjoy a beach picnic including delicacies like Walvis Bay oysters – some of the best in the world – and sparkling wine. If high tide prevents vehicle access to Sandwich Harbor, we will have the oportunity to see the Lagoon from one of the many scenic lookout points, with the option of a brisk 3 mile walk. On the return drive, more giant dunes are crossed, including the so-called "roaring dunes", with arrival back in Swakopmund around 4:30pm. Today we take a full day drive northwards, partway along the legendary Skeleton Coast (named for the numerous shipwrecks that litter its treacherous, deserted shores), before turning inland along the ancient Ugab Riverbed. Following little-known tracks, we continue north past the Brandberg Mountain (the second largest monolith on earth), searching for Namibia's famous desert wildlife and marveling at incredible geological formations. 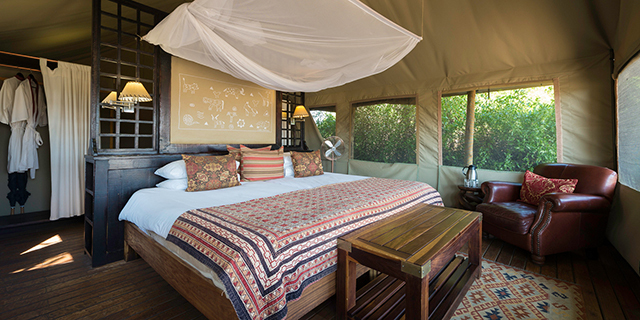 Overnight at Damaraland Camp on a fully inclusive basis. 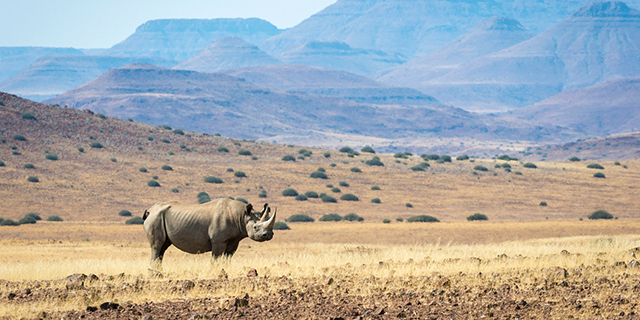 Today we push deeper into the wilderness of Damaraland, following the Huab Riverbed to Desert Rhino Camp. The rugged, rocky and mountainous terrain brings with it the opportunity of seeing giraffe, mountain zebra, oryx, and springbok, as well as the formidable desert black rhino. 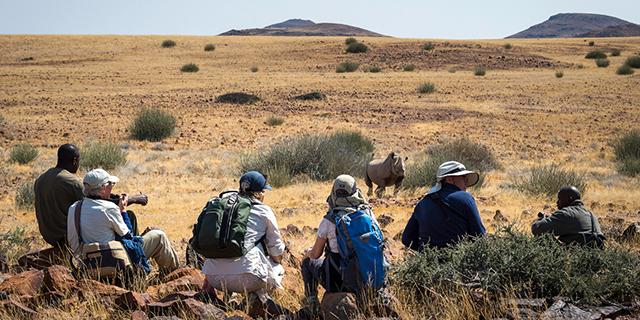 Two nights are spent at Desert Rhino Camp, with a focus on tracking the rare and endangered desert rhinos which are monitored and protected by the Save the Rhino Trust. Today we drive to Doro Nawas Airstrip for our light aircraft transfer to the remote and luxurious Hoanib Skeleton Coast Camp. 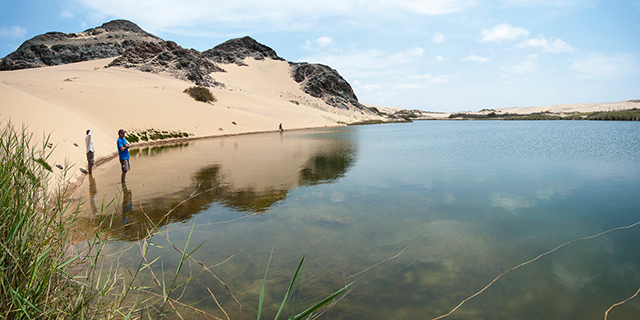 This is arguably the most diverse and beautiful area in all of Namibia, with everything from roaring sand dunes to desert mountains, oases to ancient riverbeds, desert elephants to rare desert lions; and then there is the eerily beautiful coast itself, with the Skeletons of ships and whales that have washed up on this very inhospitable stretch of shoreline. This morning we fly to Doro Nawas airstrip, and then continue by vehicle to the 66,000 acre Ongava Private Game Reserve, adjoining Etosha National Park. We will enjoy the benefits of staying on a private reserve adjoining Etosha National Park, with easy access into the Park itself. Activities include game drives into the Okaukuejo area of Etosha where Lion, Elephant, Cheetah, Gemsbok, Springbok, and Hartebeest can be seen. In addition, walks and night drives are enjoyed on the private reserve. Departing Ongava in the morning, we transfer by road to Windhoek (roughly four hours), arriving by 1pm. 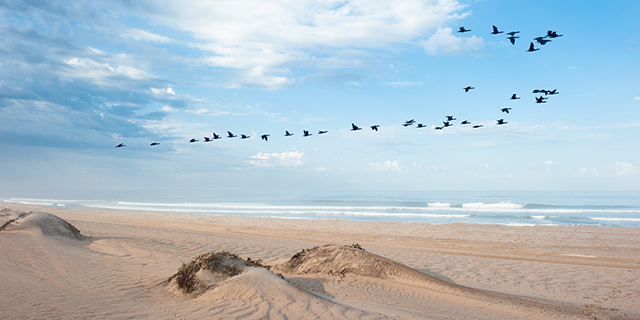 Bid farewell to Remarkable Namibia as you depart Windhoek under your own arrangements.